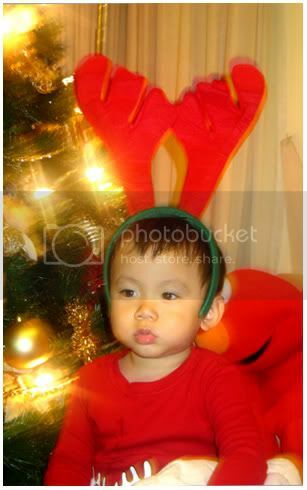 My li' reindeer :) - A mummy's inane blabberings..
Overheard in the lift at SPH main office yesterday.. Guy 1 : "Le transfer ke ti kor ah (translate : which division are u transfered to)? Guy 2 : "CNA lor!" Guy 2 : "Err 'Get Real lor! wu Diana Ser lor!" 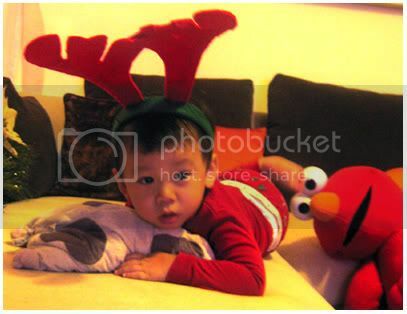 Heh..the 2 guys were obviously from the production side, probably cameramen for Ch U..
you have the cutest reindeeeeeeer! heh..he should look really cute in it too!!! post soon! Then the cameramen should be sad that Ann Poh hasn't gotten a MCTV contract. heh..they weren't exactly 'happy' about Diana Ser..but i thought it was funny the way she was described..
Love those reindeer ears. Glad to hear that you are still employed and in a position that you were hopeful for! What a huge relief and what a traumatic time this is for all the media people! yeah..it was really quite traumatic. The worse was the long wait for the list. But quite a no. of my colleagues were let go too..quite sad..especially for it to happen during this festive period when everyone should be celebratory and joyful..
men will be men. hahahah! Heeehee, the last pic of him looks like he's wearing a ballerina's costume; elmo's feet look like the tutu and his shirt is pulled tight like a ballet top. 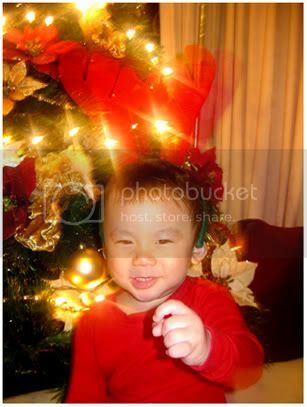 Love your weetle reindeer, want one too. yeah eh..he does look like he has a li' skirt ard him :) so dainty hehe (like real).. The first pic made me laugh and laugh. heh..i din realised till u mentioned it..hiaks! U coming to the party? Can come over to swim first with ur kiddos! Prob will see u at Carol- Christopher's party the day before! eh You've to translate...dont really get the last part. MY SIL is getting very handsome ah!!! Ok Ok... MIL apologises.... will keep Macy only for Aidan and stop her roving eyes to Gab. 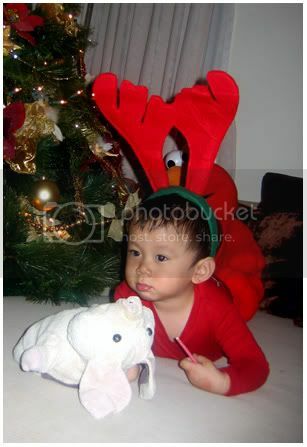 Aidan is so co-operative, to wear the reindeer headgear. He looks that he put on some weight liao... Keep it up!!! he looks so adorable!!!!!!!!! He so guai, let u piut headgear on him...Shuen would yank it off immediately.